On a mission to combat issues of heart failure, disproportionately endured by Black Americans yearly, the National Newspaper Publishers Association (NNPA), the largest Black-media resource in the Unites States, took the lead on a very important conversation surrounding heart health and its ongoing negative impacts on people of color. During the organization’s mid-winter conference, the Jan. 24th session gave way to a high energy panel discussion, that vehemently pushed for people of color to actively “get ahead” of their heart health. 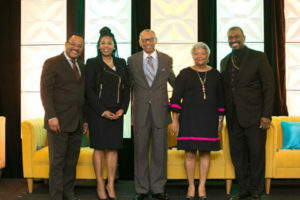 Bishop Elton Amos, M.D., key panelist and founder of Church Of God In Christ Global Health and Wellness, an organization devoted to promoting healthy lifestyles among minorities, championed the conversation on heart health and its effects on Black Americans. Often deemed the “unholy trinity,” according to the American Heart Association, three other dangerous health factors including high blood pressure, obesity and diabetes, all play vital roles in increasing ones chances at succumbing to heart disease and strokes. The report by the American Heart Association also went on to state that in relation to high blood pressure, also known as “hypertension,” Black Americans have the highest rates of this disease around the world and are more likely to have cases of diabetes in America, over their White counterparts. In the United States, Black Americans are also disproportionately affected by obesity. Among non-Hispanic Black Americans, age 20 and older, 63 percent of men and 77 percent of women are reportedly overweight or obese. To combat heart failure and thigh blood pressure, obesity and diabetes, the American Heart Association recommends scheduling regular doctor appointments, checking your blood pressure regularly, eating healthier diets and increasing consistent exercise.